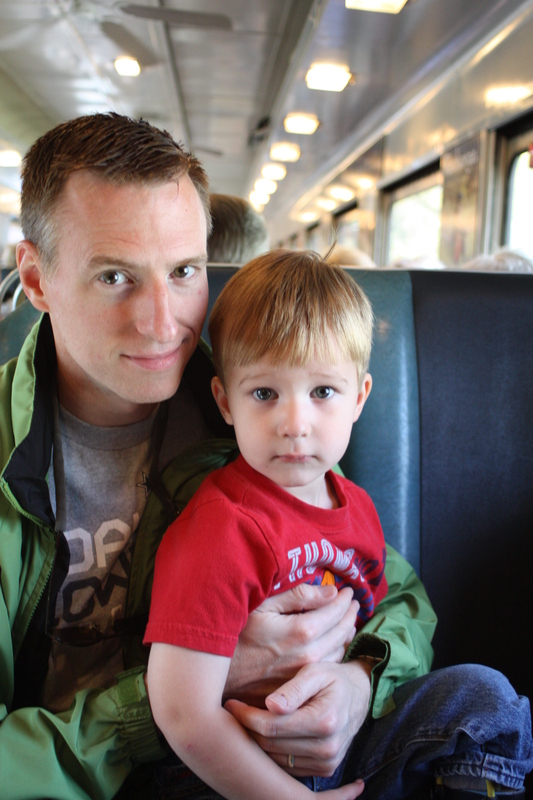 Heavy clouds and the threat of rain couldn’t dampen our enthusiasm for a trip on the Blue Ridge Scenic Railway last Monday for Carlton’s third birthday. For weeks leading up to the big event, I felt pangs of sentimentality about my youngest son following the same journey as his brothers from toddlerhood to full blown boyhood. I wanted – maybe even needed – this day to be meaningful and memorable. After a 2-hour circuitous journey from Lilburn to Highway 5 that took us through Forsyth and Cherokee counties, we arrived in the quaint town of Blue Ridge all set for our low-speed adventure. Thanks to a school holiday there were a few families among the 515 passengers on the full train, but the clientele was mostly seniors, including a group of Lutherans who filled our car. My wife and I had agonized over the decision to purchase seats in a closed car rather than an open air car. As it turned out, we had plenty of opportunity to enjoy both. With the airbrakes wheeshing and the whistle blowing, the Lutherans belted out a rousing rendition of “I’ve Been Working on the Railroad.” It was value added. The train covered the 13-mile journey to McCaysville in right at an hour. The leaves weren’t quite at their peak, but we weren’t really looking at the leaves. The boys seemed more interested in the snack bar and the on-board toilet. I could write an entire essay on the juxtaposition of the hillside mountain homes with the ramshackle houses along the Toccoa River, but let’s just say the scenery was a mix of urban escapism and quaint nostalgia backdropped by an occasional golden- or crimson-leafed hardwood. When we got to McCaysville, our volunteer hostess, Frances, helped us escape the train before the Lutherans, allowing us to get at the front of the line at Georgia Boy BBQ. After pulled pork sandwiches, slaw, beans and sweet tea, we poked around in the railway’s northern terminus gift shop before following the walking map to McCaysville City Park overlooking the river. The boys worked out their restlessness, and Carlton met a friend, a boy about his age with the appropriately Southern name of Atticus. They pointed at ducks in the river, enjoyed the slide and swung on their stomachs like toddlers do. 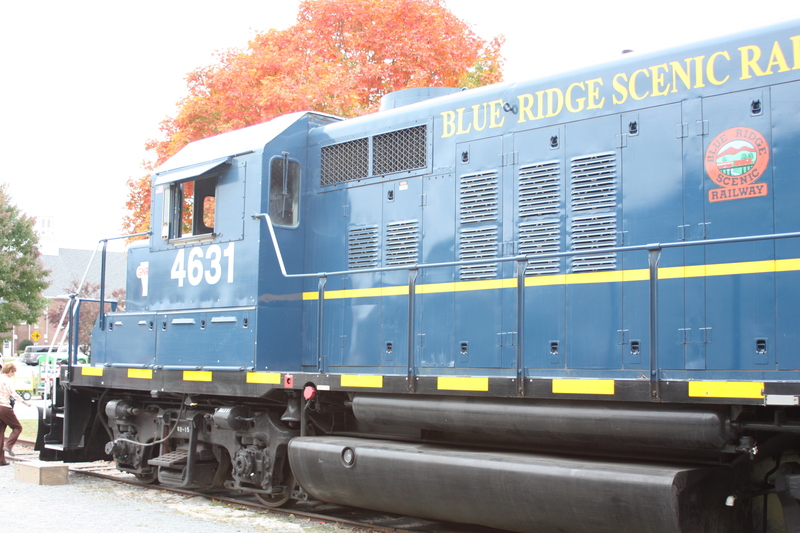 Thankfully, the engines don't talk or sing on the Blue Ridge Scenic Railway. We headed back a few minutes before the train gave the four blasts on its whistle to signal the return trip to Blue Ridge. Carrying Carlton, I stopped at the blue dotted line in the parking lot of the IGA grocery store. Frances had told us it was the state line, separating McCaysville, Ga., from Copper Hill, Tenn.
Deriving an odd thrill, I straddled the line, holding Carlton close. “Hey, buddy. We’re in two states now,” I said, prompting a puzzled look from the newly-minted three-year-old. That’s how I felt – a foot in two states. I still wanted to be a parent of a toddler, at least for a day longer, but I knew Carlton was quickly maturing into boyhood. There would definitely be more monumental birthdays and more significant rites of passage along the way, but for me, this was the moment I had been searching for to validate my grieving the loss of Carlton’s infancy and early childhood. The ride back was nap inducing, but Carlton sat in my lap and forcibly held my eyelids open. He didn’t want me to miss anything. Though drowsiness almost overtook me, I didn’t want to miss anything either. It all goes by too quickly, even on a slow train. We concluded the experience with a fried apple pie at Mercier Orchards and set off back toward Atlanta. It had been a good day. The Blue Ridge Scenic Railway provided a journey I’ll cherish for a lifetime. This entry was posted in Uncategorized and tagged birthday, birthday party ideas, Blue Ridge, Blue Ridge Scenic Railway, Carlton, Copper Hill, fall leaf tour, Georgia Boy BBQ, Lance Elliott Wallace, Lance Wallace, Lutherans, McCaysville, Mercier Orchards, New South, New South Essays, NewSouth, railroad, South, Southern, Southern Culture, Southern Living, the South, three-year old birthday party, train. Bookmark the permalink. Thanks for the tears in the carpool line. I think I may boycott Nate’s 3rd birthday now. Glad it was a great day for y’all! Sorry for the tears, but glad it moved you. Monday was an important reminder to me to pay closer attention to these moments. Sounds great. I’ve been to Blue Ridge but didn’t do the train ride. I went with Toni Draper, Mary McCoy, Judy Guerra and Lea Bond. I’m sure you remember the “LunBun.” We had a great time too. My compliments and blessings on you being such a wonderful Dad. Keep up the good work. The “foot in two states” statement . . . Right on the money. Our youngest is turning four next week and the image of you straddling the blue line created a surge of emotion that made my grin falter. Love your writing. I’ve told you before that I read a lot of your posts at once… looks like I’m way behind on “catching up” this time 🙂 Love this one. Definitely had me tearing up 🙂 Wow.